I really hate not publishing an article between the weekly PoW, but I haven’t yet finished a post about Lake Trout in Upstate New York and I’ve come across two great shots that I wanted to share… So this week its a “double feature”. 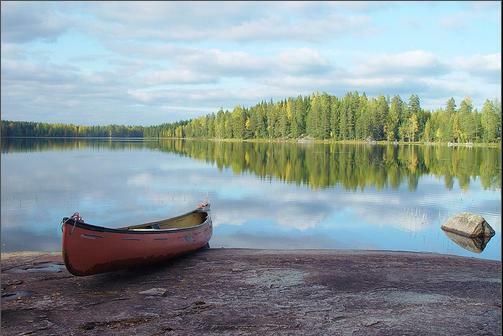 The next shot is also from Finland. 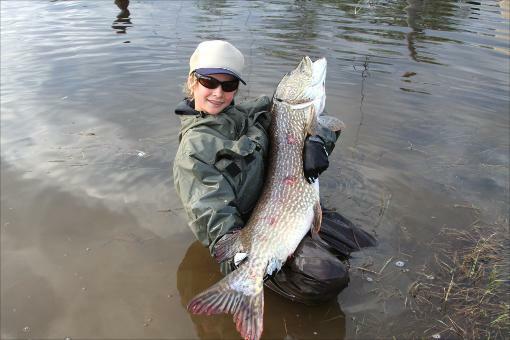 A fellow blogger, Simon Graham, loves to fish for pike as is a phenomenal photographer. I visit his blog to learn how to tie some fantastic flies, and mostly so see his amazing photography. You can see more of Simon’s photographic work at Fishing Blogdom. This is sometimes used in a check kiting scheme where someone takes advantage of the time between writing a check and a banks ability to quickly cover the check and balance accounts. Ok, BORING! Which is at least one reason I’m glad to be writing about another kind of float which is significantly much more fun. In December of this year, I’ve been invited to float down the Alumine River in Neuquen for six days in individual inflatable boats or “floats”. So, of course, I’m getting all excited and checking my gear. 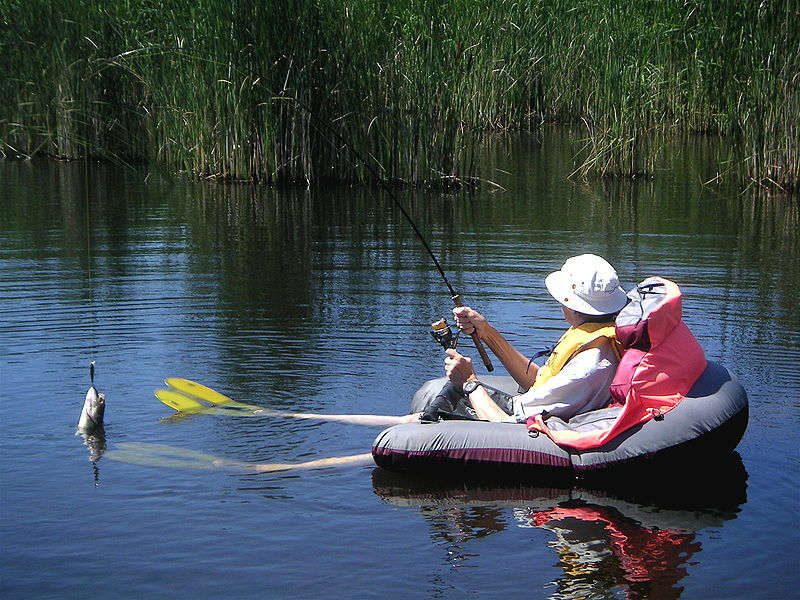 Personal inflatable floats are extremely practical for those of us who, while traveling around for non-fishing reasons, may come across a body of water or a stretch of river and reschedule the trip around a few hours of indulging our addiction. From a eco-tourism point of view, its also less damaging to the environment since these units don’t use combustion motors or fuel. In the meantime, I thought I’d share some of what I’ve learned. Please feel free to comment and share your insights, knowledge, experience and info about small, individual float watercraft. These are sometimes referred to as “belly-boats”. They are modeled after the inner tube of a tire, but with obvious improvements and comforts. The major difference is the shape. This personal floating device was originally designed for anglers that want to get a lower profile access to fish in ponds and small lakes. Since your partially submerged you maneuver using your legs and feet. Using swim fins is a common practice for locomotion, but be sure they are strapped on tight. If you loose one in the middle of the lake, or even close to shore, recuperating the lost fin can be quite a problem. Some units come with oars, however due to the already compact space this might become cumbersome when you also have to worry about your fishing rod. The fisherman is also low in the water when using the tube and thus decreasing the range of motion for effective rowing. The oars and any attempts to use them will also significantly diminish efforts toward increased stealth. Belly boats are generally round like and inner tube. Float tubes tend to have a U or V shape. These are great for fly fishing particularly if you really like to connect with nature in the process. These craft are quiet and convenient for the fisherman who practices catch and release and likes to travel light. 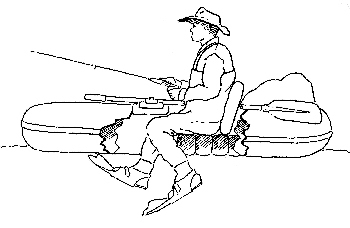 If you like the advantages of low profile, easy storage and transport, as well as, the simplicity of deployment, you may want to consider the use of hip or chest waders while operating the belly boat to keep yourself dry and somewhat warmer than if you were directly exposed to the water. These units are generally not used in rivers where currents can cause problems with maneuverability and control. Pricing generally runs anywhere from $100.00 to $300.00 dollars. Weight can also vary. 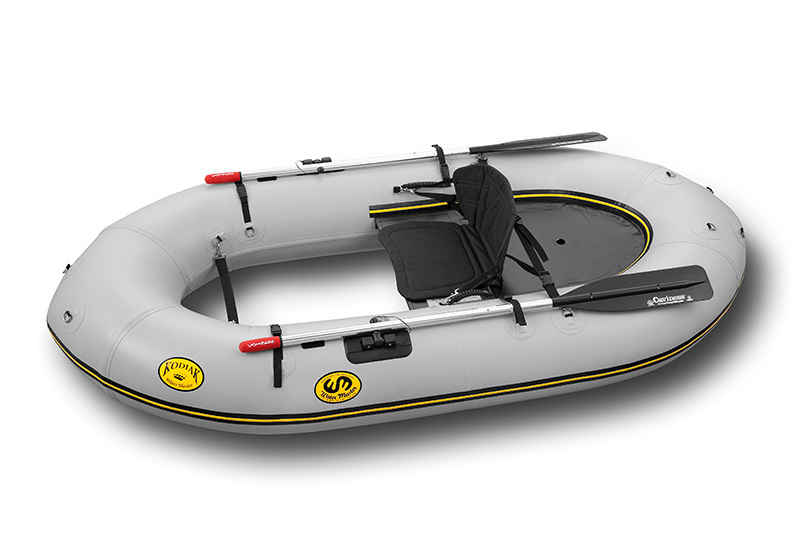 The simpler float tubes weigh as little as 8 lbs., and as much as 18 lbs., when fully assembled. Overall of the three options for personal floating units I’m reviewing here, this is the lightest and easiest to pack and transport. The weight capacity of a belly boat is the lowest rated of the three types of floats discussed here, but they are still pretty capable with ratings up to 300 lbs. Many units come with repair kits and you can also purchase extra repair kits separately. Some units have a pump included while others don’t. Be sure to check for that if you order. It can’t make a difference in the over all cost. I think these belly boats are small enough that a foot pump it quite sufficient. An electrical pump is overkill. Another type of floating tube is the Kickboat. This is basically a raft with an open floor design let’s you sit on a seat to propel and steer the raft with fins on your feet while you keep both hands free for casting and landing fish. In shallow water you can stand up and wade while the raft floats around you. 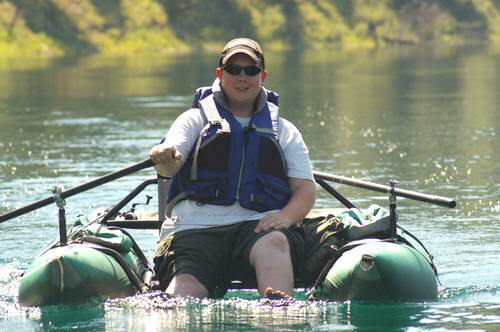 The kickboat is generally larger than a float tube. You still rely on your legs and feet, but can more easily incorporate oars. There is also added space, with a kickboat, for gear. You may also be able to manage rivers with very light currents and even lift your legs out of the water when approaching a fishing spot. 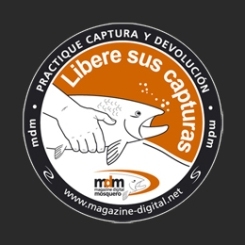 This reduces your profile from the perspective of the fish you are targeting. There tends to be no rigid frame with a kickboat, so you won’t be able to utilize a small electric motor as with some Pontoon Floats. You may also have some difficulty attaching an anchor to this type of float. Regardless of its limitations, I think this unit is pretty cool. 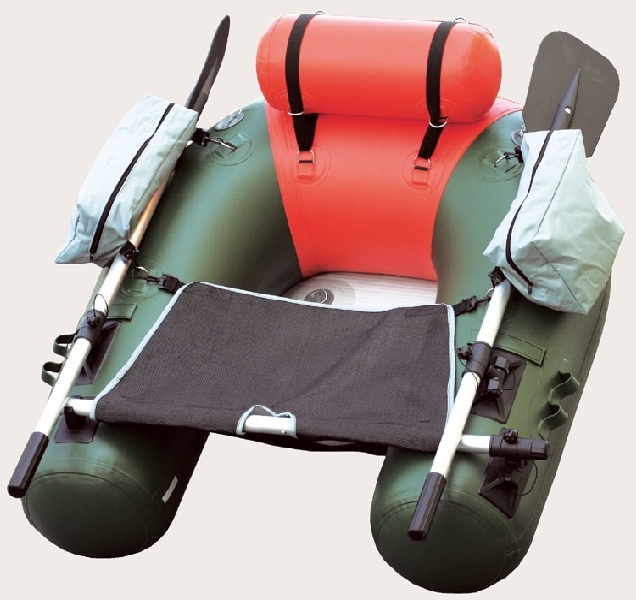 It may not be recommended by the manufacturer, but I could see myself using the kick boat as a makeshift air mattress when its time to make camp on a multi-day river-float. Pricing on the kickboats tends to be a bit higher. I’ve found them to be the most expensive of these three options. The prices usually range from $1000.00 dollars and up. These are also much less common. Belly boats and Pontoon Floats seem to be dominating the market. For me that is an important aspect of whether or not to outlay the cash for a float. Competition generally means better price and service. There are also fewer sources that I can go to when or if I have an issue. Weight for these units is around 30 lbs., so they are still light. They are almost 8 feet long, but lengths may vary. Finally, these units may provide the maximum weight capacity of up to around 400 lbs. (excluding multi-seat pontoon floats) and some as high as 750 lbs. 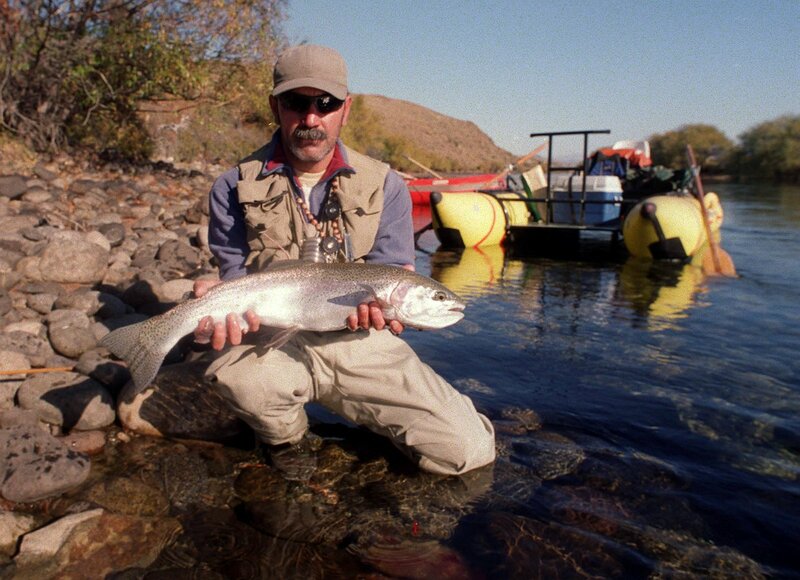 These are also often rated higher in terms of the River Class or White Water Rating. Belly boats are rated Class I, whereas kickboats may be as high as Class III or IV. These personal watercraft are a step up (a big step) from the belly-boats and tube floats. They are based on the inflatable pontoon boats used by professional guides, but much more economical. The guide boat version of these pontoon floats have greater capacity in just about every aspect, and are much more like a boat than a float, so I’ll only be looking at this option from the personal-inflatable float point of view. 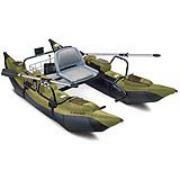 These units appear to have the best of both worlds between the advantages of belly boats and kickboat/rafts. There is a lot of space, range of motion, weight capacity, ease of storage and transport, stealth, etc. The main difference with the pontoon floats is the rigid metal frame. The frame is necessary because of the pontoons and thus it adds overall weight. It is the heaviest of these three personal float options. From my research into brochures and user reviews, the frame seems to be easily assembled and disassembled. The oars also come in two or three piece configurations. As compared with the two other options, the pontoon float also has a higher seat which may provide for better visual perspective and range of motion for operating oars or casting a fishing line. There is also a lower underwater profile since feet and legs are above water. Some models are large enough and stable enough to allow the user to stand on the foot rest platform, but most models have foot pegs which are adjustable according to the height and comfort of the user. Among the various models available the major differences were in length, weight capacity and the ability to utilize an anchor and electric trolling motor. There are even models that come with PVC molding on the pontoons to provide greater rigidity, are rated higher in Class, but suffer in terms of weight, transportability and accessibility in terms of cost. Pricing of pontoon floats ranges from $200.o0 to as much as $2000.00 dollars depending on the manufacturer, materials and warranty. However, I’ve found that there are very acceptable models from between $300.00 and $700.00 dollars for the kind of lake and river fishing I plan to do with such a unit. My personal thought is that for any river rated higher than Class II, I would probably want the comfort and security of a conventional raft or Pontoon raft. Weight is surprisingly light considering the rigid metal tube structure of the pontoon float. The lightest are round 35 lbs. with the heavier models around 80 lbs. 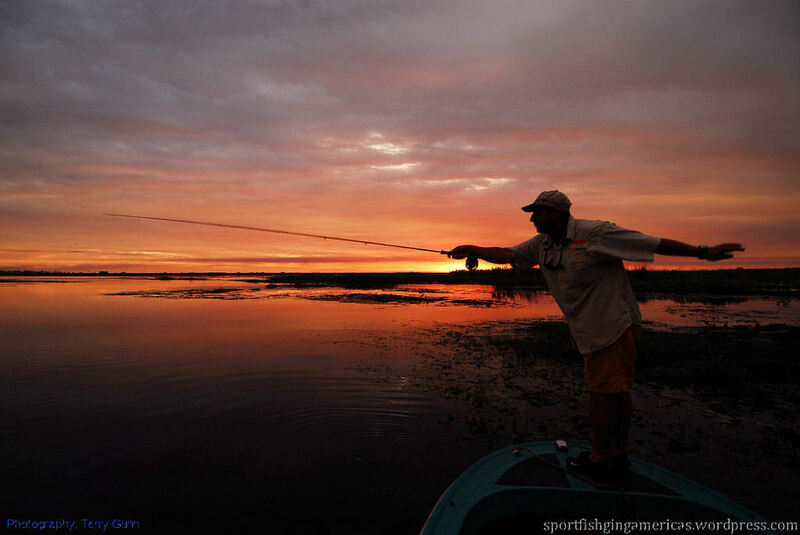 This week’s PoW features a fishing guide (Javier) from Goya in the province of Corrientes. 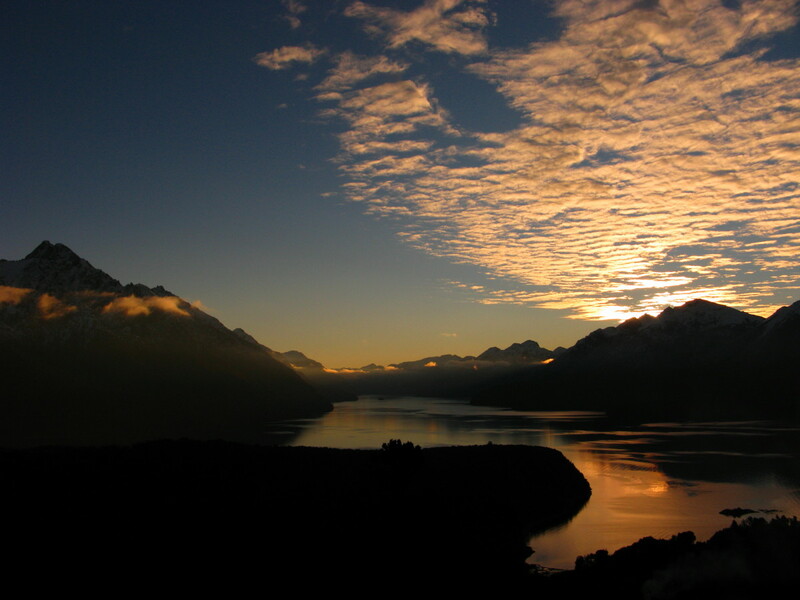 This beautiful shot is from the photography gallery of fishing guide and nature photographer Terry Gunn. Terry has graciously given SFA access to his galleries and I plan to share his work from time to time on the PoW posting. This week I wanted to share with everyone a message that my Uncle (the Hamm’s Beer jingle-singing uncle) Paul sent out to several of the fishermen among friends and family. These trips to Canada have been going on since I was a little boy and even before. I was green with envy thrilled to receive these pictures and an account of the week. There is some great information here that will be useful to anyone who is interested in visiting Trout Lake. There’s also a link to the Sandy Beach Lodge website. 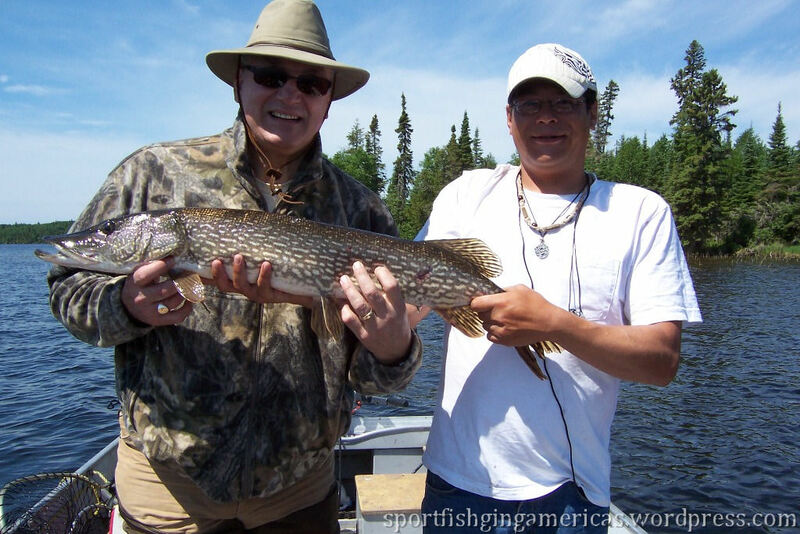 Be sure to tell Wade (he runs the place) you heard about Sandy Beach on Sport Fishing Americas.